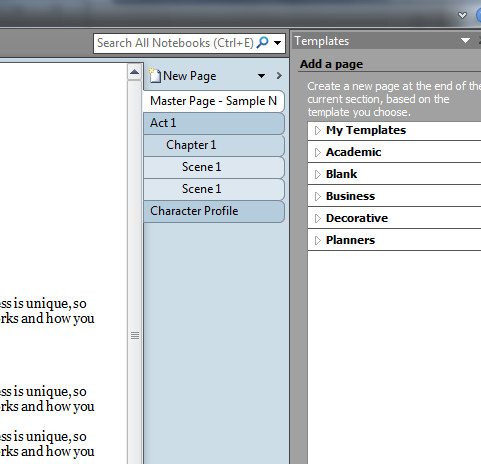 »Author's Journey»How to use Onenote to write a novel. *WARNING – This post contains a lot of writery, authory, novel production type stuff. It may be quite boring to any of you who have never been a part of the writing process. Sorry. I had been looking into an organization strategy for writing my novels for several months. Recently, I upgraded my MS Office programs and acquired Onenote. From the product description, it seemed like it would work just fine. But I had no clue how to make it work. After all, it was unlike any software program I was familiar with. So I did some template research, and found there was very little out there to help writers. I did find a couple blogs about the subject. From them I gleaned enough information to start using the program. 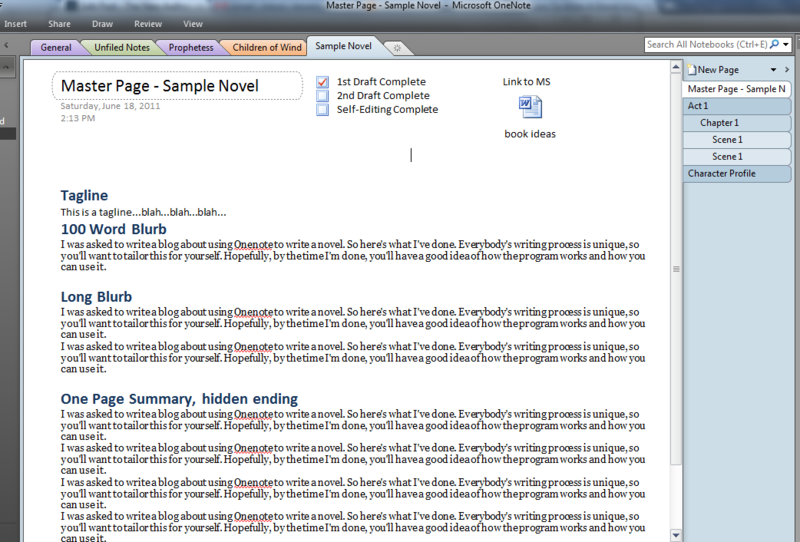 I was asked to write a blog about using Onenote to write a novel. So here’s what I’ve done. Everybody’s writing process is unique, so you’ll want to tailor this for yourself. Hopefully, by the time I’m done, you’ll have a good idea of how the program works and how you can use it. If you’re like me, you have a folder on your computer with at least half a dozen Word and/or Excel files, containing character descriptions, setting lists, summaries of different length, outlines, and of course your master file. What Onenote does is put all that information into one easy to navigate location. When you start using Onenote, you’ll find all those cumbersome files obsolete. Think of it like a three-ring binder, with tab dividers for all of your different sections. As you collect information and organize, you stick stuff under different tabs. Under these you compile everything you need to write each story. What you want to do is start a new Notebook for your story. One Notebook is all you need for one story. These Notebook tabs are at the top. Switch between these tabs when switching between projects. On the right hand side you’ll see a New Page button. This is where we’ll create your subsections, pages, and templates. So let’s talk about creating a template. Click New Page. An Untitled Page will pop up. It’ll be blank, with a title text box at the top. Let’s make this a template Master Page for your novel. Type in the box “Master Page – Title Here.” Just like that…it’s a template, remember? Always start a new page generic, so you can save it as a template. That’s important. Once you’ve done all that you’ll want to save this as a template. If the template menu has been closed, simply click the arrow on the New Page button so it drops down. Click Page Templates and the template menu will open. At the very bottom is a link “Save current page as template.” Name it Master Page Template, or something. Now you should see it in your list of My Templates and under the drop down arrow by the New Page button. Why so many? Because once put in order, you can right click and make them subpages, and it really creates an organic outline system. All subpages can be collapsed under the parent. 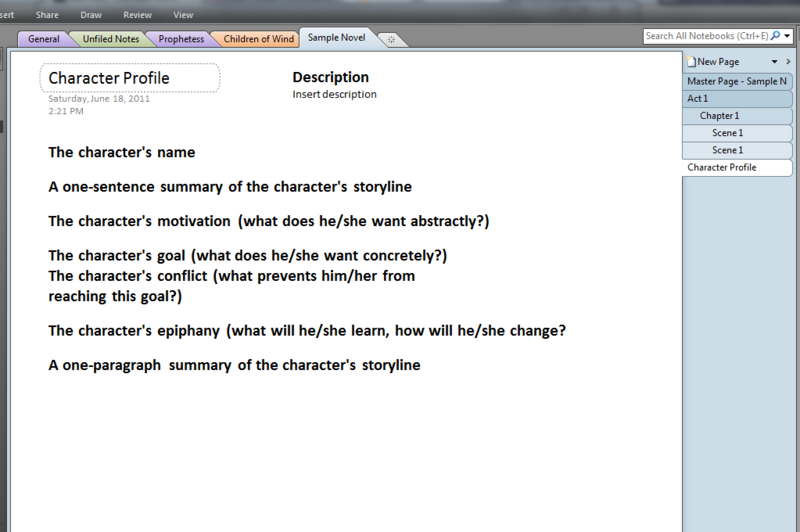 For example, say you have Act 1>Chapter 1>Scene 1. Act 1 contains a detailed description of that entire act. Chapter 1 contains a detailed description of that chapter. Your scene template has a lot of descriptions, it’s complete, and you’re ready to write the scene. You write it and click the check box showing it’s written. When all the scenes are written for that chapter, you collapse all the scene pages under the chapter, and then click “All Scenes Written” on your Chapter template. When all the chapters have been completed this way, you collapse them under the Act, and click “All Chapters Written” on you Act template. And once all the Acts have been written, you can collapse them all, if you wish, and click “1st Draft Complete” on your Master Page. No more flipping between multiple Word docs or Excel docs. It’s all in one place, perfectly organized and ready to browse. A few other features you should know about. Onenote integrates perfectly with all other Office products. You can insert from any of them. While surfing in Explorer, you can highlight text, right click, and it’ll send it straight to Onenote to be sorted into your Notebooks later. Same with images. Onenote will help you collect all your research easily. You can also go to File> Send and make any of your pages a Word doc. And most importantly…You’ll notice there’s no save button. That’s because Onenote is constantly saving and backing up your work. In fact, if you give it your Passport login information (Msn, hotmail, live) it will auto backup and sync with your Skydrive. Then you can access your work from anywhere via the Skydrive Onenote interface online. Or share it with multiple people for group projects. Hopefully, if you’ve stuck around and walked through the process of making that first template, you’ve got the confidence to develop your own and organize it to your liking. I think it’s going to be very productive for me and I hope it will for you too. There’s no right or wrong way to do this. The hardest part is getting past that initial intimidation with a program still unfamiliar to many of us who live and breathe in Word. Interesting use of OneNote, Kevin! I use OneNote for other things, and some of this is very new to me. I like the yWriter programs (shareware from http://www.spacejock.com), myself. 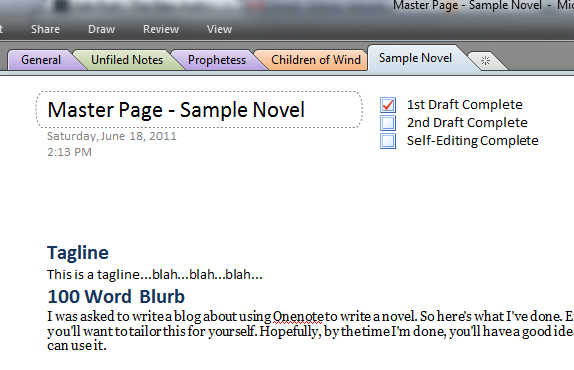 But I’ll have to keep this use for OneNote in mind. I would’ve liked some screen shots of “collapsing the outline,” and a more detailed step-by-step of how to set up a template (with screen shots). But I can probably figure it out on my own, if I take the time. Pretty impressive way of doing it, but that’s to much work and organization for my novels. I’d get lost in the information, or have nothing to put in because I make it up as I go. Thanks for the suggestion on One Note. If I ever get around to using it, I’ll keep it in mind! I’m a OneNote newbie and thankfully found your site. Great instruction – very easy to follow. Thank you so much for sharing your knowledge! 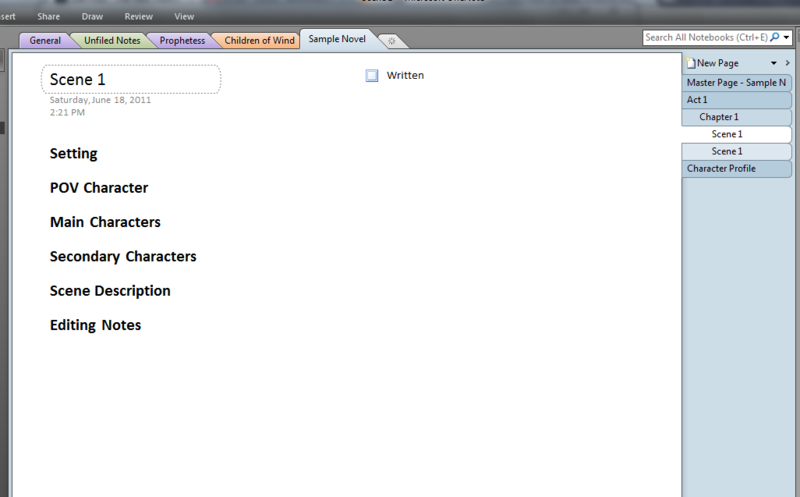 I used onenote for the novel i’ve just completed. i started writing in word, and also sometimes need to write longhand (especially when feeling my way through complex emotions), but about halfway through the first draft the various character threads became too complex and i started typing straight into onenote. i find it good particuar;y when i have fargments of dialogue and action that come to me out of sequence… i type them somewhere onto the onenote page and move them about as necessary. it’s not possible to do that in word. 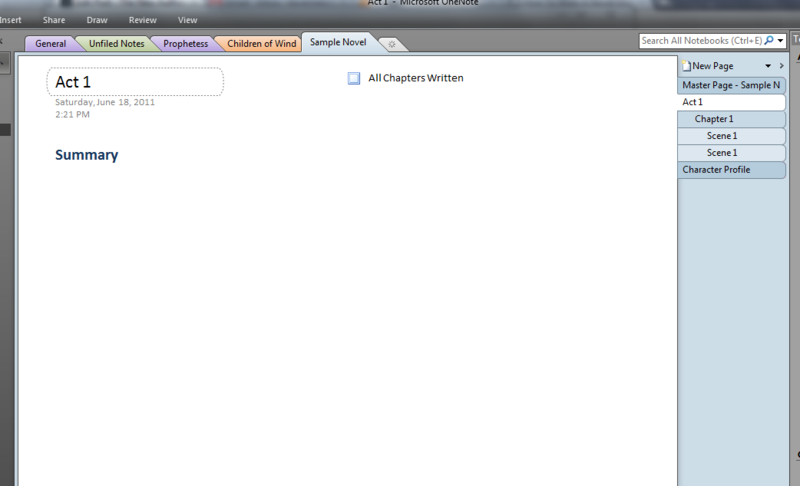 onenote doesn;t feel as intimdiating as word, and i feel i can be more organic with the writing. it wasn’t completely planned, i just opened a new tab as i needed to, and kept a separate top tab for each character plus any other bits that weren’t yet assimilated… i finally redrafted in onenote, using it to keep tabs (literally) on each scene and was able to organise them clearly. i also created a ‘master plan’ by devising a table in onenote, with each chapter and scene laid out in the table and hyperlinked to its location in the onenote notebook. the final stage of my novel process was dragging each scene back fom onenote and into word, which, while quite tedious, did not take as long as i feared and was quite a useful revision tool in its own right. sounds complicated? yes it was a bit, but it simplified what had become an incredibly complex novel. I’m now starting another novel but am at the longhand stage of writing… onenote may come later. it evolves to suit one’s purposes, i believe…! unfortunately onenote’s spellchecker isn’t as good as word’s, which is unfortunate when your typing’s as bad as mine. How do you print out the final draft? It looks like everything is jumbled together, so separating them into output must be difficult? Is there an option for word count? what’s really nice about One Note is that everything synchs up. I have yWriter and like the organization it gives, but it forces one into a particular template and copying from one to another source is not simple, i.e., writing on a notebook while traveling, then finishing on my home PC is easy with One Note. @mike: you can export from onenote (notebook, section or specific page) directly to word. No need to drag pages independently. You must be in “desktop” mode if you have windows 8. The mobile version on win 8 has a different interface designed for touchscreens. Google search “docked windows” for onenote. You can do some very serious auto referencing. Onenote is also available for iPad, for free. The OS version looks different, but it works and links to you desktop/laptop, etc..
One Note is a fantastic program. It has a slight learning curve but once you get the basics it’s amazing how easy it is to organize tons of information. One note is always running on my system. When I find a web page for research or info, I just right click and send the entire page to One Note – I have the date, source, info all together – no more post its everywhere. When and idea pops into my head, I just click on One Note and jot it down quickly. Take the time to use it – you won’t be sorry.